I made it to LA! After my (very rainy) 6-mile run this afternoon, I am officially finished with my journey. I would be seeing the sign above after a 2,736 mile journey. Lots, lots more to follow when I have a few minutes. For now, I'm enjoying my journey being complete. It's been a long, long road and I'm thrilled to be at the end. I'm 2,730 miles into my journey with only 6 miles to go! As you can see from the picture, I'm just about to get off of 105 West to get onto Highway 1 for the last few miles into Los Angeles International Airport. I did 8 miles and some change this morning so that I'd have an even lighter run later this week. One more run and I've run all the way across the country! 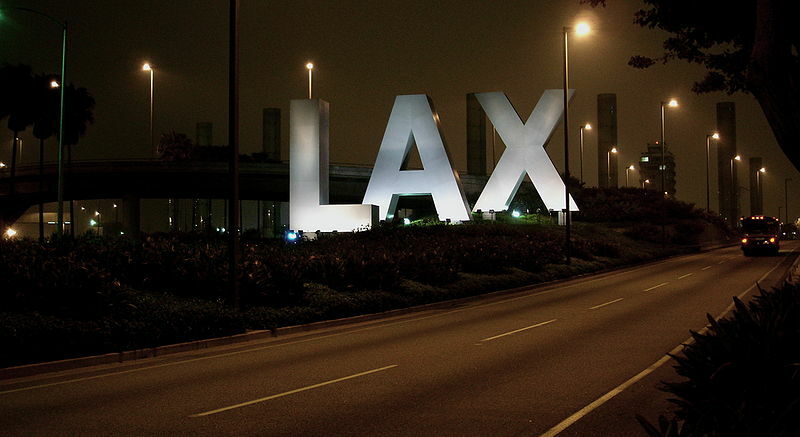 Well, the big news is that I'm only 15 miles away from LAX! I will get to the finish line by the middle of this coming week, and I can't tell you how excited I am to get there (and how ready I am to kick down the miles). I'm now 2,721 miles into my journey and I'm on 105 West toward LAX. At this point, the only quick turn I'll need to make is onto Highway 1 to turn into the airport. I'm in Lynwood which was named after Mrs. Lynn Wood Sessions, the wife of a local dairyman. The town is close to Watts and is the residence of, among others, Weird Al Yankovic, Venus Williams, Kevin Costner, and Glen Bell (the founder of Taco Bell). I'm planning to make my final run at White Park in Concord, NH, on Wednesday morning. That's where my graduation will be on May 15, so I thought it was the right place to end the journey. I'll be ending a week and a half early! The Times (UK) recently wrote about the change of the male mid-life crisis. It used to be fast cars and younger girls, but now it's triathlons and ultramarathons. The article goes through the shift from material things to how we are making a shift to crazier and crazier athletic feats. Though I'm not quite in what would be considered "middle age," I did fall into a quarter-life crisis around 28 when I realized that I was not looking the way I wanted to look, and I wasn't looking the way that I used to look. So I started on a plan to be more athletic. Now, I'm (very thankfully) almost done with my three-year journey from Philadelphia to LA, and I need to decide what's next. I did do an ultramarathon and have run a couple marathons as part of my quarter-life crisis. Though I'm not running across the Sahara desert like some of these guys, I guess we all have our sports car equivalents. Besides, I've got a couple of years before the mid-life crisis begins. I just hope I'll choose triathlons and ultramarathons. They're cheaper than sports cars, but these days, probably not by much. I'm 2,680 miles into the trip and have turned west onto Route 210 and have just passed Rancho Cucamonga. I'll take 210 until I get to Butler and then I'll head southwest toward the airport. I have 56 miles remaining and 36 days to get to LAX. At this point, I only need to average 11 miles a week, which is 10 less than I have been averaging. I haven't decided whether I'll cut back on mileage and switch to biking a bit so that I can get the time line closer to graduation, or whether I'll just plan to finish it when I get to it. I'm now 2,569 miles into my journey and am just passing Keenbrook, CA on Route 15. I'd give you some facts about Keenbrook, but the internet seems a bit void of them. I'm sure the town is, um, beautiful. I was in Texas last week for a law school competition and was only able to eek out a 4-mile run over a 5-day period, so I was a bit concerned about my mileage. This week, I was able to get 19 miles in (had to cut my 7-mile run today a bit short). Before plugging in the mileage, I thought that I'd have to worry about an increase in mileage to get me to LAX by May 15, 2010. It turns out that the opposite is true. Based on my mileage to date, I only need to run another 77 miles. Based on the six weeks left until graduation, that means I just have to do a bit over 12 miles a week to get there--no problem (I say, knocking on wood). The next big turn is from Route 15 onto Route 210 West toward Pasadena. I'm starting to smell the (virtual) LA air!